In Kupang, Indonesia, I found a lot of enthusiasm for online engagement with Australia. After spending time at universities in Bali, I flew to Kupang. Lily met me at the airport! It was so good to see her! 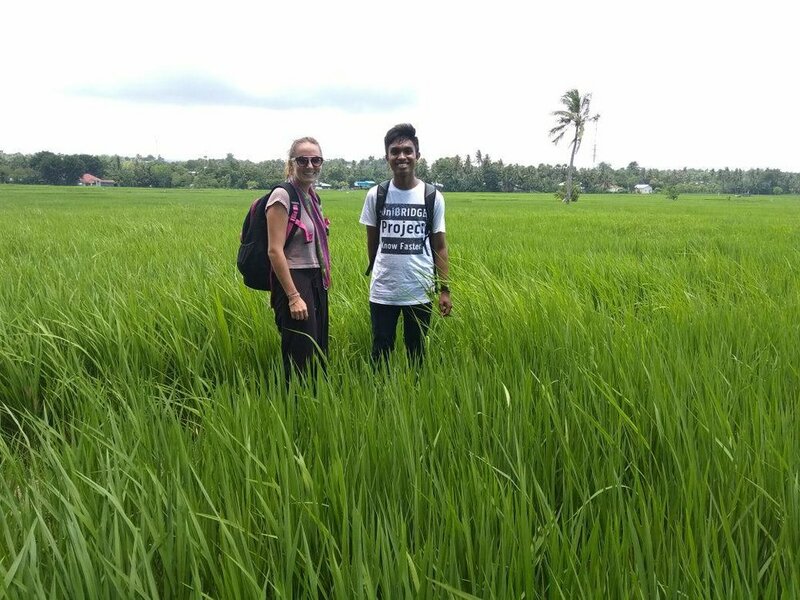 She helped me get straight back to the hotel because Rizkhy and Reymond were competing in the Pemilikan Duta Bahasa Indonesia 2018 competition! As jam karet would have it, we had plenty of time to watch the boys. It was so interesting to watch. Each competitor dressed in the motif particular to their region. The finalist had to do a speech on Bahasa Indonesia and how they would encourage young Indonesians to study the national language, their local language as well as a foreign language such as English. On day two in Kupang, Lily, Rizkhy, Ronney, Santi, Richard, and I as well as some friends who weren't UniBRIDGE participants went to the crystal cave and then a waterfall. Crystal cave was beautiful, I had to overcome my fear of heights and dark water to be able to swim in the dark cave. We had to climb inside and there was very little light but it was such an incredible experience! Rizkhy was even jumping off a platform-like rock into the water because it was so deep! The waterfall was also beautiful and was so much fun with such a big group. The next day, Ibu Nina, the International Relations Officer, invited me to join her family for a birthday lunch with Santi and Rizkhy. It was amazing! There was traditional Indonesian food as well as food traditional of Kupang. They wanted me to try dog. Rizkhy tried assuring me that it was never a pet and is bred and produced just as chicken or cow would be. I have always known people eat dog but I have never partaken as it is so different to our culture. We live with pet dogs and it just seems so unusual. But I thought it best to try it with friends, as bad as I felt eating it. It was definitely an experience, but I don't think I'll ever eat it again! We had a massive information session with Nusa Cendana students on Tuesday, all students were welcome. It became much like a conference with a mediator, MC and a desk for all the speakers. Unlike Australia, there was a prayer to open and conclude the meeting. 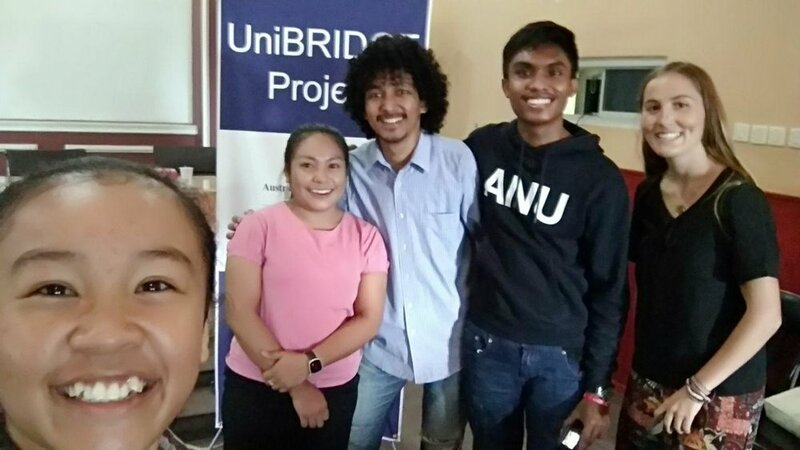 I explained how the program worked while mentors of Unibridge including Lily, Rizkhy and Qrezpy talked about their experiences with Unibridge and their scholarship tours to Australia. We then had a workshop at Polteknik University to explain the program and try to get Polteknik to join us as an official university member. All the students were very excited to get involved, as were the rektor and international relations officer. The following day we had a workshop with all the students from Nusa Cendana who were interested from the prior information session. 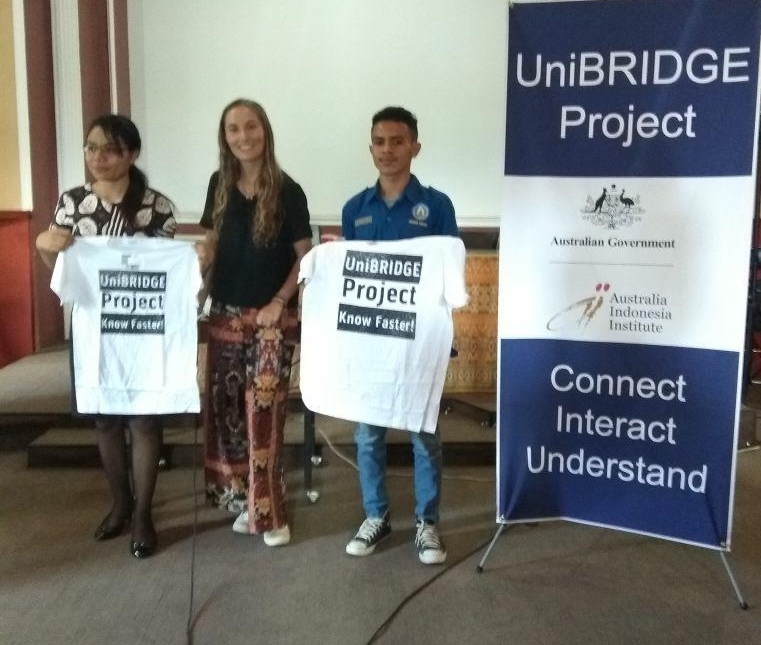 This was used as a session to teach everyone how to use the Unibridge rooms and how to meet Australian students. It was great to have current members and mentors there to help the new members. My last day was really sad. I woke at 6am to go for an early walk with Lily before going to a beach with Santi, Richard and Rizkhy. We didn't swim there because there is a lot of crocodiles in Kupang. We watched two boys fish, one on the bank of a lagoon and another hanging off a branch above. They fished with a stick with a single line of fishing string connected to two tiny hooks. They used small worms that looked like tiny witchetty grubs as bait. They caught tiny fish just small enough to fit into the opening of a 600ml bottle, which they would use to catch bigger fish later. I left with even more friends in Kupang than I had on the first day. They all wanted to say goodbye at the airport and help me get there. I told them there's no way they were going to get my bag on a bike to the airport. However, I was very wrong and very impressed. Ronney drove the bike while Richard held my bag. Santi drove with me on the back while Lilyen and Desy came on another bike. I am so grateful to meet such beautiful people and it was very hard to leave. I had such an amazing time with lots of memorable adventures and made many new friends that I hope to see again soon. Thank you Indonesia, feeling blessed yet again.